The embedded rechargeable battery allows up to 1 hour continuous scanning. Most 3D scanners have at least two wires: one going to a computer and another one for power. Our 3D scanner doesn’t need any wires at all. «Thor» has a built-in touch screen, so you can begin and stop scanning by pressing a button on that screen and you can see what you are scanning while doing it. «Thor» weighs less than 2kg (~4lbs) and is less than 40cm (15in) in length. This means you can take it with you to scan the neighbors or hop on a plane to visit a reclusive village in the Amazon. The airlines won’t harp, because the scanner won’t add much to your carry-on weight. 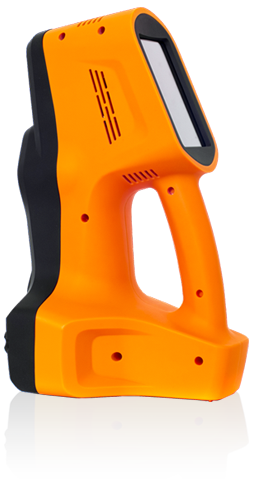 «Thor» can produce scans with 3D resolution of up to 1mm (0.03in), while keeping the accuracy of 0.2mm (0.007in). While, these specifications are similar to a few scanners on the market, the novelty is Thor’s large field of view (FOV). This 3D scanner’s FOV is twice as big as anything on the market, which means that scanning is done in half the time. We’ve tried to make it as simple and intuitive as possible. 3D Scanning large static objects. Historically, 3D scanning of large objects has been frustrating for anyone trying to do it. Various technologies have been tried by industry professionals and have proved to be ineffective and even infuriating at times. Thor3D scanners were designed specifically to overcome those challenges. 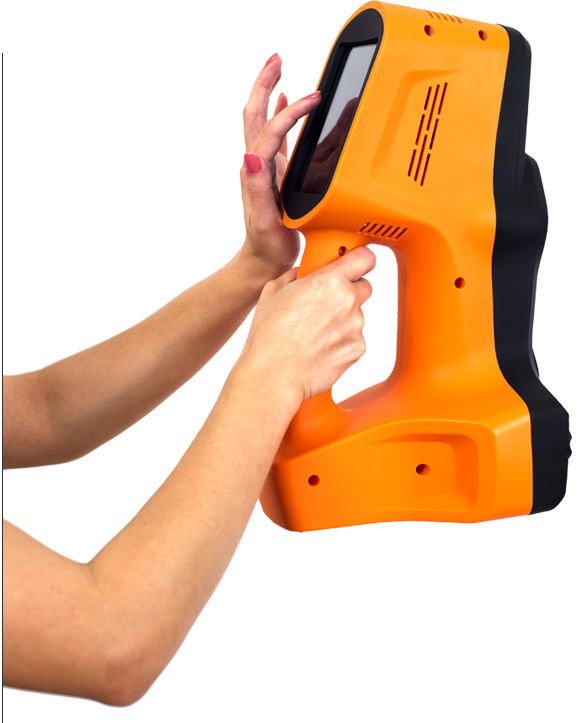 The Thor3D scanner can scan a car, boat, plane, furniture, military tank or a large statue with ease. The scanner doesn’t lose its alignment during scanning (which is a frequent issue with other scanners) because it uses large markers to overcome this problem. 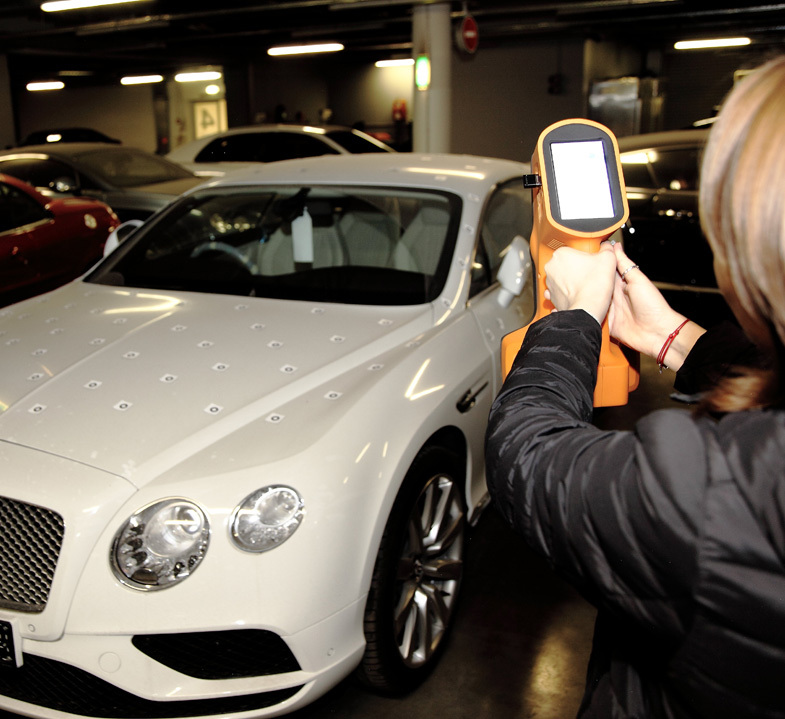 The user spends a few minutes before scanning, applying these markers to the object and then quickly captures the item. Scanning this way, removes any doubt about the quality of the data, as well as makes the process of capturing effortless. Furthermore, traditionally, shiny and metal objects have been hard to scan, but that problem has been solved by applying Thor3D’s patented hardware and software technology. Humans move and breath and wiggle. This makes it difficult to 3D-scan them. However, Thor3D makes capturing people a breeze because the scanning process takes about a minute. Most folks can stand still for that long and even if they move a bit, Thor’s powerful software algorithms can correct for those slight changes in shape. To scan a person, ask your subject to pick a pose and to hold it. Take the scanner in hand and walk around him, capturing from every angle. Alternatively, you can place your subject on a rotating table (use the Thor3D turntable or any other available on the market) and move the scanner from the person’s head to his feet, as he spins in front of the camera. In this scanning mode, there is no need for markers and the post-processing is done automatically. And since the scanner is lightweight (1.8kg) and portable, you can take it to events and scan dozens of people in a day without needing a computer. The next day, at the office, simply finalize all the models and the job is done without hassle. Once the scanning is done, you take out the USB flash drive from the scanner and transfer the scans to a computer. For your convenience, we have included a software program that will finalize the model and export it into a format you need. This utility has a Simple and an Advanced mode. The Simple mode is fully automated, while the Advanced mode, gives users the ability to cut, smooth, align, fill holes, etc. So choose the mode you are most comfortable with. We’ve tried to make it user friendly, without taking away advanced options. To learn more about Thor3D software here.